Terror group that rules Gaza reportedly seeks cease-fire in exchange for easing of restrictions on goods entering Gaza. Hamas leaders in Gaza have sent messages to Israel through various channels in recent months offering to negotiate a long-term ceasefire. 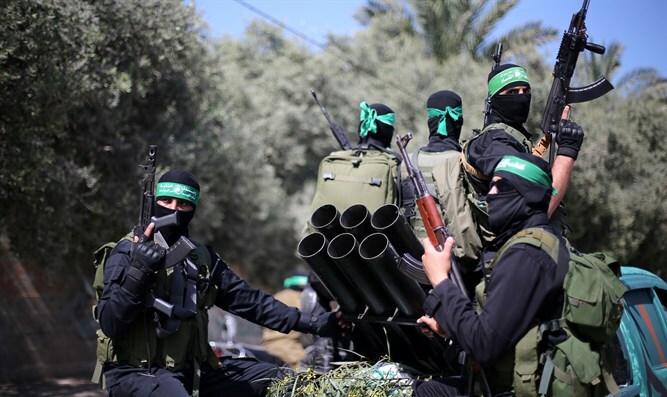 According to a report in the Israeli daily Haaretzon Monday, Hamas wants to tie the cease-fire to an easing of the partial blockade on Gaza, a green light for large-scale infrastructure projects and a prisoner exchange. Israel has “not responded clearly” to the messages, according to Haaretz. Hamas reportedly is more open to discussing such a cease-fire since it is in “dire and unprecedented strategic distress,” the report said. In addition, reconciliation efforts between Hamas and the Palestinian Authority remain frozen in the wake of an assassination attempt in March on PA Prime Minister Rami Hamdallah during his visit to Gaza. Hamas has called on Gazan demonstrators to continue to protest at the border with Gaza as part of the March of Return protests, and has vowed that the protests will continue past what was supposed to be the end date, May 14, the date on the Gregorian calendar that marks Israel’s 70th birthday, and which the Arab world calls The Nakba, or The Catastrophe. The Palestinian Authority also is planning a large demonstration on that day in Ramallah in the West Bank, the seat of government of the PA. The Israel Defense Forces estimates that 70 percent of the 48 Gazans killed in the current protests are connected to Hamas or the military wings of other terror organizations in Gaza, according to Haaretz.